"The results of The Nation’s Report Card: 2014 U.S. History show that many U.S. students lack a strong understanding of our nation’s history. 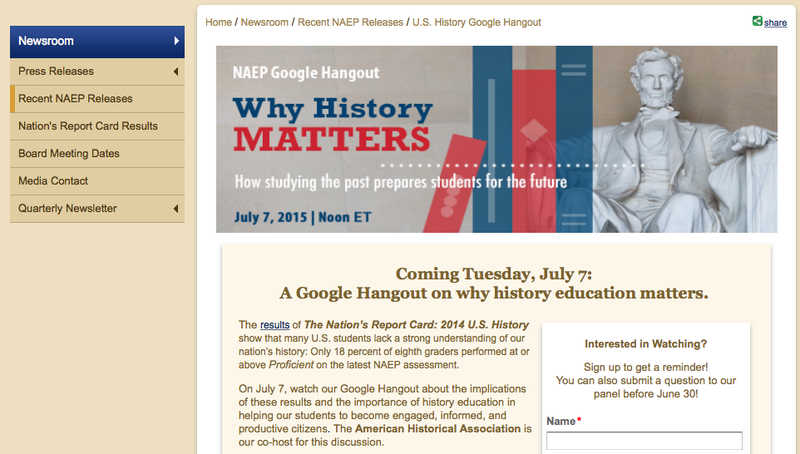 "The National Assessment Governing Board and the American Historical Association are co-hosting a discussion on the implications of these results and the importance of history education in helping our students to become engaged, informed, and productive citizens." Be a part of this by going to this link. 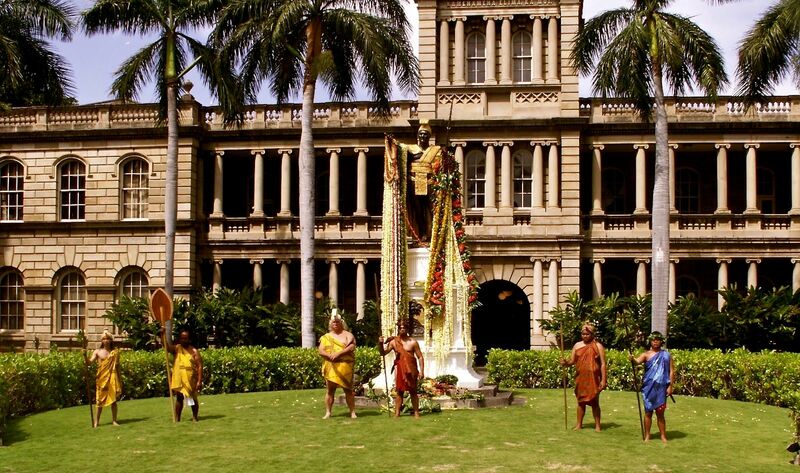 The King Kamehameha V Judiciary History Center invites the public to Alakaʻi: Traditional & Modern Leadership. What were the qualities of a good leader in traditional Hawaiʻi? What qualities do we look for in leaders today? What are the qualities needed to lead Hawaiʻi into the future? Malcolm Nāea Chun shares his research on the role of aliʻi in traditional Hawaiian culture and how the qualities inherent in a good chief should play a role in Hawaiʻi as we move forward. Brendan Burns, the grandson of the late Governor John Burns, discusses the leadership attributes associated with his grandfather, a man from humble beginnings who went on to become one of the most celebrated leaders in modern Hawaiʻi. Governor Burns displayed leadership abilities that brought commitment from supporters, commanded respect from adversaries, and led a political revolution at a time when change in Hawaiʻi was needed. What lessons can we learn from these models of leadership? This is a free event. RSVPs are required. (Click here). 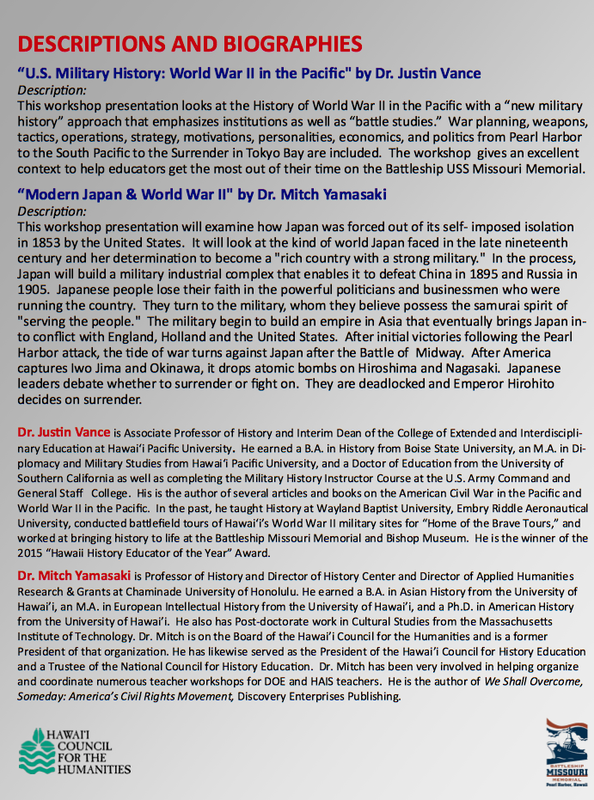 Saturday, June 13, 2015 9:00 a.m. - 4:00 p.m.
History Education Hawaii, Inc., the state council of the National Council for History Education (NCHE) extends its aloha and warm welcome to this year's conference attendees. History Education Hawaii expresses its special thanks to the National Council for History Education (NCHE), co-sponsor of this annual conference. History teachers, historians, students and scholars, and the general public are invited to celebrate the subject of history, to highlight the value of history education and its benefits to a diverse, globalized and interconnected world. The conference seeks to foster a new beginning for all who love the subject of history through considerate dialogue, the building of new partnerships, energized relationships, all with the goal of strengthening our understanding of the complexities of as well as the pleasures of studying history in our contemporary world. Holding a Bachelor of Science from West Point, a Masters in Asian Studies and a Ph.D. in history from the University of Hawaii at Manoa with a specialty focusing on China and Southeast Asia, Dr. Corcoran is a noted historian and authority on military history, diplomacy, Asian Studies, national and international security issues and strategy. Dr. Corcoran is a career U.S. Army officer. He was the director of Asian Studies in the Department of National and International Security and Strategy at the U.S. Army War College in Carlisle, Pennsylvania in the 1980s and 1990s. He published a series of conference reports on Asian Security as Rapporteur for the National Defense University. He recently authored an article in the newsletter of the Association of Diplomacy and Military Studies. His reviews have been published in the World History Association Journal. His latest article is due to be published in the Vietnam Ministry of Foreign Affairs Journal "Vietnam and the World" in June, 2015. Dr. Corcoran teaches courses on history and Asia in Hawaii Pacific University’s (HPU) Military Campus Program and serves as a Curriculum Area Liaison for History, Diplomacy and Military Studies, and as the contact point for Asian Studies. He is the recipient of the HPU Trustees’ Award for Excellence in Teaching 2012-2013, HPU Teacher of the Year, and recipient of the HPU Faculty Assembly Golden Apple Award for Distinguished Teaching, 2011 Undergraduate/Adjunct. The Hawaii Council for the Humanities and the National History Day Executive Director presented an award to Professor Corcoran on May 9, 2015, at the 25th Anniversary celebration of Hawaii History Day, for his long-time service and dedication to Hawaii History Day. 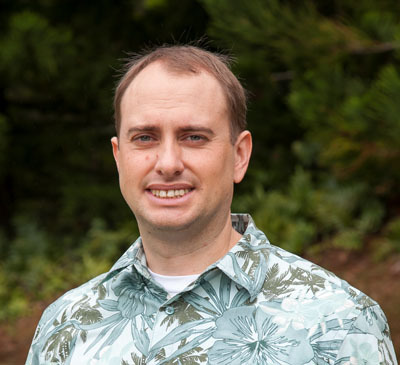 Join us in honoring Hawai‘i Pacific University associate professor of History Justin Vance, Ed.D., recently named the 2015 Hawaii History Educator of the Year. We're also pleased to announce that Dr. Vance was nominated and will be awarded a special medal by the Sons of Union Veterans of the Civil War. The SUVCW is a fraternal organization dedicated to preserving the history and legacy of those who fought to save the Union. Organized in 1881 and chartered by Congress in 1954, it is the legal successor to the Grand Army of the Republic. 9:00 A.M. - 9:30 A.M.: Doors open at Aliiolani Hale, the Hawaii Judiciary Building. by Jeffrey Bingham Mead, co-founder and president, History Education Hawaii, Inc.
Attendees are requested to stand and briefly introduce themselves. ABOUT THE NATIONAL COUNCIL FOR HISTORY EDUCATION AND HISTORY EDUCATION HAWAII, INC.
Presenter(s): Dr James Corcoran of Hawaii Pacific University. 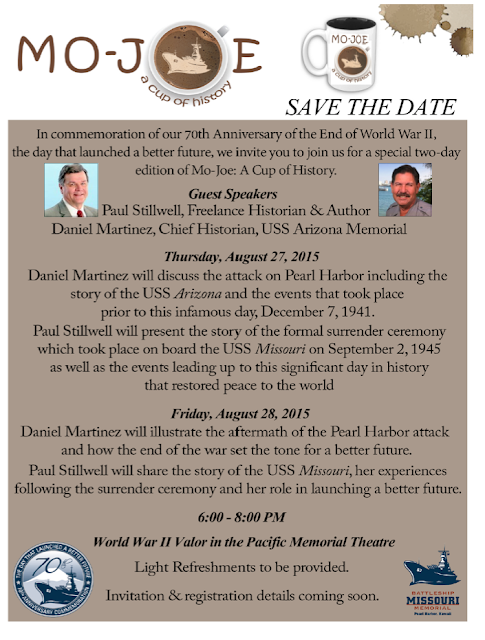 Presenters: David Cypriano, King Kamehameha V Judiciary History Center; David Suhs, U.S.S. Missouri Memorial; Dr. James Corcoran, Hawaii Pacific University. Others are invited as well. 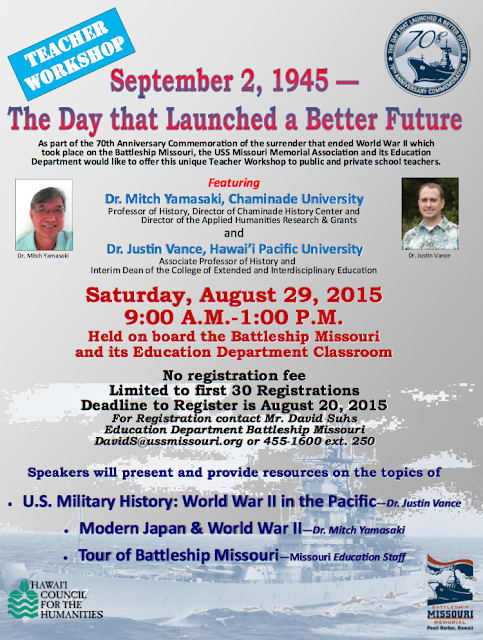 HISTORY EDUCATOR OF THE YEAR 2015: Dr. Justin Vance, Hawaii Pacific University and the Hawaii Civil War Roundtable. MEDAL PRESENTATION: To Dr. Justin Vance, Hawaii Civil War Roundtable from the Sons of Union Veterans of the Civil War (SUVCW). PRESENTATION: African American History in Hawaii. Presented by Dr. Allison J. Gough, Ph.D., Associate Professor of History and Chair of the Department of History, Hawaii Pacific University. Noon to 1:30 p.m. The Judiciary History Center's museum will be open for your interest and enjoyment. PRESENTATION: Using Children's Books to Teach History. Presented by Professor James Tueller, Brigham Young University Hawaii. PRESENTATION: A Story of an American China Marine. Presented by Jeffrey Bingham Mead. HONORING YOUNG HISTORIANS: Hawaii Team representing the Aloha State at the National History Bowl. Comments by Jeffrey Bingham Mead, History Education Hawaii, Inc. 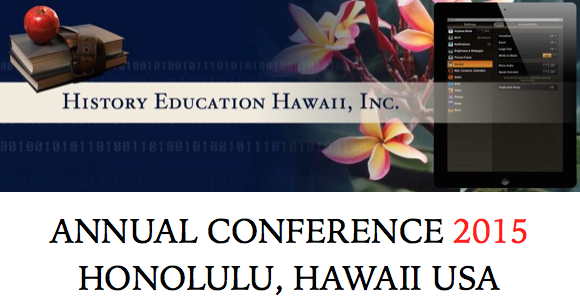 ANNOUNCEMENTS, MEMBERSHIP & CONCLUSION: National Council for History Education and History Education Hawaii, Inc.
by Jeffrey Bingham Mead, History Education Hawaii, Inc.